Chrystiane Charles is recognized as one of the foremost creative bronze artists and sculptors in the field of lighting of her generation. Born in 1927 her early creative years were spent with Gimont, Janniot and Saupique until joining her husband (Jean Charles)’s family business, Maison Charles et fils in the late 1950’s. 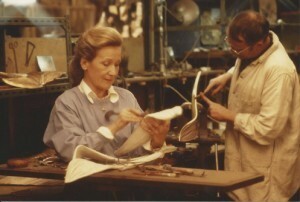 Chrystiane Charles was involved with Maison Charles for nearly twenty-five years (1959-1982), during which time she served as designer then President and also for a period helped develop the Charles spirit as its artistic director. Chrystaine Charles sadly passed away in 2013. 3details has been fortunate to acquire from her estate a collection of Charles’ original working plaster maquettes, bronzes, lighting, photographs, drawings, tools and other ephemera. The collection will go online and be exhibited later in 2016.